The world has lost an enormous talent. Christina Grimmie was just 19 years old when she was a contestant in the 6th season of The Voice, which aired in 2014. It was the first and only season when Shakira was one of the judges of the reality show. During her blind audition, Grimmie chose to sing Miley Cyrus' "Wrecking Ball." 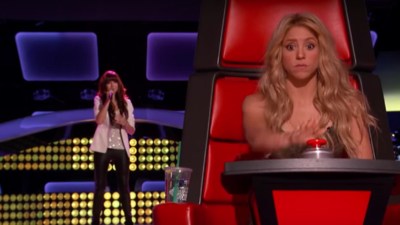 After a few seconds of the song, Shakira's stunned face says it all: she had to immediately turn her chair around to see who was that girl with the powerful voice. Before The Voice, Grimmie ammassed a following on Youtube doing pop songs covers. The singer passed away on June 10, 2016 from gun shot wounds after performing in Orlando, Florida. The investigation is ongoing. She was 22 years old and was on tour with the band Before You Exit.